Linger outside after dark and you'll be in for a treat next week. Four of our solar system's bright planets will be arranged in the western skies at the end of June. Jupiter, the brightest "star" in the sky is the easiest to see, but Mercury, Mars and Saturn are there too. The waxing crescent Moon will pass right through the region over several days, pointing the way to these other planets. 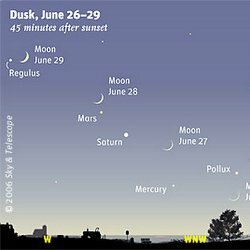 The best nights to see the planets are on June 27th and 28th, about 45 minutes after sunset. Once again Green Heron Mom is sitting deep in the old nest at the Upper Lobe. Incubation began during the last few days, it appears. But everything is at least a month later than the timetable we're familiar with. The Green Herons I wrote about in Red-tails in Love [p125-128] began incubation on May 26 . We saw the first two of five fluffy chicks on June 23rd that year. With a few exceptions the Green Herons have been nesting in Central Park every year since then. June 1994 was just after Pale Male's second failed nesting attempt at the Fifth Avenue nest that preceded his first successful nest--three chicks in 1995. Success at last. This year, twelve years later, we've again endured a second failure in a row at 927 Fifth Avenue, following the nest-removal crisis of December 2004. Now the Green Herons are nesting again. The consolations of nature. Where have the herons been this year? Have they had a failed nest somewhere else.? They aren't saying. But better late than never, say their Central Park fans who are looking forward to fuzzy heron chicks in three or four weeks. That brings us to mid July. The chicks will spend another three weeks growing in the nest before fledging in early August, by my calculations. Then almost a month of Green Heron finishing school at the Upper Lobe. The kids should be independent by Labor Day. When I kept a small flock of backyard chickens (The Chicken Hilton, room rates one egg a day, occupancy: 6) It was easy to tell which hens were laying well. They lose yellow pigment first from their legs, which become progressively paler and paler as pigment is taken from there and deposited in the yolks. Then skin (which can be seen by picking up a bird and gently blowing feathers aside (does that tickle, I wonder?) Free-range chickens who get to eat grass and bugs and stuff have deeper colored yolks than factory birds. And it is my understanding that Mr. Purdue's chickens are fed marigold petals to give a richer color to the packaged chicken pieces skin. Captive flamingos must be fed shrimp, shells and all, for deep pink feather color. Until zoos discovered this, all their flamingos looked bleached. those red tails and those orangey chests. library, and see if I can find a paper. We've gone a long way in our pursuit of answers to the mystery of the orange-chested nestlings. First we thought it was a genetic aberration marking Pale Male's offspring only. Then we wondered if it was something about the diet of local hawks -- some pigment found in rats and pigeons.Then it became clear that orange-chested redtail nestlings aren't all that unusual-- you can find them in redtail nests all over the country. Indeed, it began to appear that white-chested nestlings were the unusual ones! That brought us back to the genetic origins of the orange coloring. Only now we saw that it was not exclusive to Pale Male's genes; it was universal. Chris Lyons, who has been fascinated by the subject of the orangey chests, returns to consider some new aspects of the dietary genesis of erythrism -- another, perhaps less clunky word we could use in the future in place of orangey-chestedness. While I had thought we'd dispensed entirely with the theory that the chest coloration is related to diet, I find myself wondering if that's really true. It certainly isn't related to the specific types of prey animal ingested by the young hawks. But it could be that the orangey color is too costly an investment for chicks being raised in areas where prey resources are scarce. John Blakeman has many times reminded us that in areas he typically observes them, Red-Tails and other birds of prey struggle much harder than our urban raptors to find sufficient food to rear their young. It may be that this is one reason why the chest coloration is seen so often by urban and surburban observers of Red-Tail nests--because the proximity of large numbers of humans means the unusual abundance of suitable prey animals like pigeons, rats, and squirrels; meaning that all the chicks may get more than enough food to manufacture these marker pigments without compromising other aspects of their development. And it also means larger brood sizes, which means more competition for parental attention, which might make the chest coloration more useful. However, I don't see any alternative to the conclusion that at least with some species of buteo, orangey-chested eyasses have been around for a very long time. We have no reason to think that they have become any more common than they were when the first European settlers arrived in America. Except in the sense that Red-Tailed Hawks themselves are more common than they were then, which is hardly the case for most other raptor species. More people are paying more attention in more places with better photographic equipment, and a more effective means of sharing their photos and observations. That's really the only explanation necessary. I decided I'd better refresh my memory of the difference between carotenoid and melanin-based pigmentation. It's not simply more difficult for birds to synthesize carotenoid pigments, it's essentially impossible. The chemicals they use to make red, orange, or yellow-tinted feathers MUST be present in the food they eat, or they will not be able to make feathers of that coloration. Melanin-based pigments, (brown, black, gray) can be made from essentially any food a bird may eat, but carotenoid pigments must be ingested more or less whole to be incorporated into its feathers. There's been a tremendous amount of research on this in ornithological circles, with scientists trying to figure out the significance of avian plumage (so beautiful and intricate in some birds that it cries out for explanation in Darwinian terms), and there's also been some speculation as to the different signals conveyed by carotenoid and melanin-based pigments. This does not, of course, substantiate the theory that Red-Tailed Hawk eyasses only get the orangey chests if they are fed certain foods. This would make no sense, because virtually all Red-Tails develop--well--red tails. Those tails wouldn't be red if the birds weren't getting substantial amounts of carotenoids in their diet, regardless of whether they are eating rats, gray squirrels, ground squirrels, chipmunks, rabbits, pigeons, bats, snakes, etc. The Red-Tail diet is limitlessly variable, but tail color is not--the tail nearly always turns red, across the entire range of the species. Young raptors eat essentially the same things their parents do. Therefore all Red-Tail eyasses get some carotenoids in their diet. It's possible the amount and quality of nutrition they receive from their parents may to some extent determine whether or not they get the orangey chests, or perhaps simply the extent and brightness of the coloration. I've certainly observed that some eyasses get much more orangey than others. However, there must also be a variant genetic factor, or else "Whitey" (the pale-chested Fordham chick) would have the same chest color as his siblings. If all Red-Tails were genetically inclined to develop orangey chests, then John Blakeman would have seen orangey-chested eyasses by now. By the same token, if the orangey-chested gene was rare, we wouldn't be seeing so many Red-Tail eyasses in so many different parts of the country developing orangey chests. Last night was Midsummer's Night, the shortest night of the year. A few of us got together in the park around sunset to mark the occasion, entering through the Hunter's Gate at 81st Street and Central Park West. Few people call the park entrances by their official names. In fact, all the original entrances to Central Park have names. My favorite is the Naturalist's Gate, at Central Park West and 77 St, across the street from the south end of the American Museum of Natural History. The Hunter's Gate is also across the street from the natural history museum, at its north end; it was probably named for Theodore Roosevelt, a famous game hunter and the museum's founder. But I prefer to think that the Hunter's Gate refers to hunting in the form of seeking, as in mushroom hunting or fossil hunting. The American Museum certainly derives a lot of its fame and glory from its fossil collection, one of the greatest in the world. The Solstice celebrants were in a hunting mood that evening, looking for night wildlife, and, perhaps, a few errant spirits said to be abroad on Midsummer's Night. Indeed, we were not disappointed. First we saw two Black Skimmers arriving at Turtle Pond. That was at about 8:45. The mysterious birds [Where do they come from? Where do they go?] swooped and sailed around the pond, gliding back and forth, skimming the water's surface for little fish with their long lower mandibles open. Every year at least since the year 2000 Black Skimmers have been showing up at Turtle Pond at some point in June. This year their first arrival was noted by Bob Levy on June 11. We watched then on Midsummer's Night until it was too dark to see much more than a faint ghostly shape over the water. While there we saw the Canada Goose parents and kids preening directly in front of our water-side vantage point. A Black-crowned Night-heron arrived from the direction of Belvedere Castle and promptly departed -- perhaps deterred by the Skimmers. They definitely look predatory. And prehistoric, like pteradactyls. An Eastern Kingbird twittered overhead, getting ready to roost for the night somewhere in the vicinity of his nearby nest. Then straight for the Moth Tree, where not a single moth nor any other earthly or unearthly spirit chose to reveal itself to us. Only one medium-sized spider starting to spin a web at the base of the English Oak. So we joined hands and danced around the tree, emitting mild yells and hollers and one loud screech-owl whinny. I've heard that there is a group of Wiccans [latter day witches and warlocks] who celebrate Midsummer's Night in the park every year with wild singing and dancing at the Ramble end of Bow Bridge. It would be nice to think that some of the people passing by the Moth Tree that night as we whooped it up and shook and shimmied thought we were the real thing. I kind of doubt it. David, Paula, Aidan and James Smith, Lee Stinchcomb, Noreen O'Rourke, Jimmy Lewis and myself. The highpoint of the evening was the discovery, by Aidan Smith [age 5 or 6, I forgot to ask ] of an interesting caterpillar on the trunk of the English Oak we call the Moth Tree--at East Drive and 73rd St. I had high hopes that it would turn out to be an interesting , perhaps unusual moth. Looking through David L. Wagner's new Field Guide to Caterpillars of Eastern North America, I had no trouble identifying it. Somewhat disappointingly it turned out to be a common pest -- a Gypsy Moth caterpillar. The text identified it perfectly:"Five pairs of blue warts followed by six pairs of red warts." You can count them on the picture above. "The caterpillars are allergenic to many people, especially if the hairs get in the eyes or contact vulnerable areas of the arms, neck, and legs; hypersensitive individuals may react to single hairs and scales from adults." The single moth of the evening, pictured at the top , was an American Idia, easily identified by its deltoid shape, and by the three black spots at the edge of each forewing. P.S. Below you can see the anterior prolegs of the caterpillar, found on the underside of abdominal segments three to six. The thing that looks like a suction cup at the end of each proleg is a crochet. It helps the caterpillar hold on to surfaces. In case you've forgotten, female red-tailed hawks [and other hawks too] are significantly bigger than males. That's why Rich Fleisher can confidently use a feminine pronoun when referring to the big, rambunctious one. Thank heaven for sharp-eyed readers! I'm pretty sure the photo you have is the first fledger, not today's.